Well, I wasn't planning to write up a trip report, but since no one else in the group has written one, I guess I'll go ahead and do so. Anyway, our group of three skiers (David Coleman, Paul Belitz, and I) met up with two split-boarders (Justin and Jim) at the Eldorado Creek TH. The Cascade River Road is snowfree past this point, with plowed snowbanks beside the lot. We crossed the river on a large log just downstream of the parking lot and then spent hours thrashing and ascending and descending (a lot) in the woods before finally traversing east to find the climbers trail. Some routefinding advice for others: the trail is quite easy to follow above about 2400 ft, but fairly difficult/overgrown below that (the river is at 2150 ft). So it seems easiest to just bushwhack up to about 2400 ft from the river and then traverse east to hit the trail. We followed the steep trail to snowline at 3900 ft, at the edge of the major boulder/talus field. We skinned up to 6000 ft on very wet, heavy, unconsolidated, waterlogged snow in bright sunshine. Set up camp just east of the rib separating the Eldorado and Roush Creek drainages, which must be crossed to reach the Eldorado Glacier. David and Paul took some short evening ski runs. Clouds soon moved in, and then overnight a brief shower dropped sleet/graupel for less than 5 minutes. The weather still looked gray and bleak as dawn arrived, but as the sun rose, the clouds parted and our spirits lifted. Soon we skinned up onto the rib, deskinning for the steep, shaded, and frozen drop of 100 vft onto the edge of the Eldorado Glacier. We again skinned up most of the Eldorado Glacier, and soon eyed Klawatti Peak across the Inspiration Glacier flats. Klawatti had been in our original plans, but we eventually agreed to abandon it and stick with Eldorado alone. We skied across the flats, and then up to join the East Ridge at a prominent gap at 7800 ft. We had brought ropes and glacier gear, but never needed them. We continued skinning up the ridge to over 8750 ft, with Paul alone making it to within a few dozen feet of the true summit (8868+ ft). The famed knife-edge snow ridge was a piece of cake on foot and soon we were on top, enjoying one of the most spectacular panoramas in the North Cascades. We skied directly off the knife-edged summit, angling a traverse left across the steep south slope on thick sun-warmed corn. The ski run down the East Ridge was fair, with lots of crust and sastrugi. Dropped through the 7800 ft gap onto the steep south facing Inspiration Glacier, finding very soft snow which was still fun and carveable. Similar soft conditions continued on the Eldorado Glacier all the way to the rib crossing, which the skiers were able to ascend by sidestepping. After packing up camp, the descent back to the trail was extremely soft and unconsolidated, with skis often sinking 2 ft deep in a turn. The boulder field had melted out considerably since the previous day, and it will mostly be unskiable within a few more days. Avalanche hazard was high, as numerous large wet slides had released from the steep slopes/cliffs to the west, both that day and the day before. We gingerly skied across several slide debris paths and struggled down the sloppy boulder field to reach the climbers trail. Following the trail was much easier on the way down, and we reached the Cascade River fairly uneventfully, but well upstream of our log crossing. The few available logs didn't look appealing, so we simply waded across the river in our ski boots (main channel was 20 ft across, max 18" deep, very easy) and clambered up the riverbank to the parking lot. Overall, it was a spectacularly scenic trip with fairly good to very soft snow conditions, with over 5100 vertical ft of skiing a nice reward for well over 7000 ft of gain and pain. Surprisingly, we saw only one other party on the route, they were skiing down on Saturday, and we saw no one else on Sunday. David skis down the East Ridge, with Paul and Justin below. Far below is frozen Moraine Lake, with Forbidden Peak rising above it. 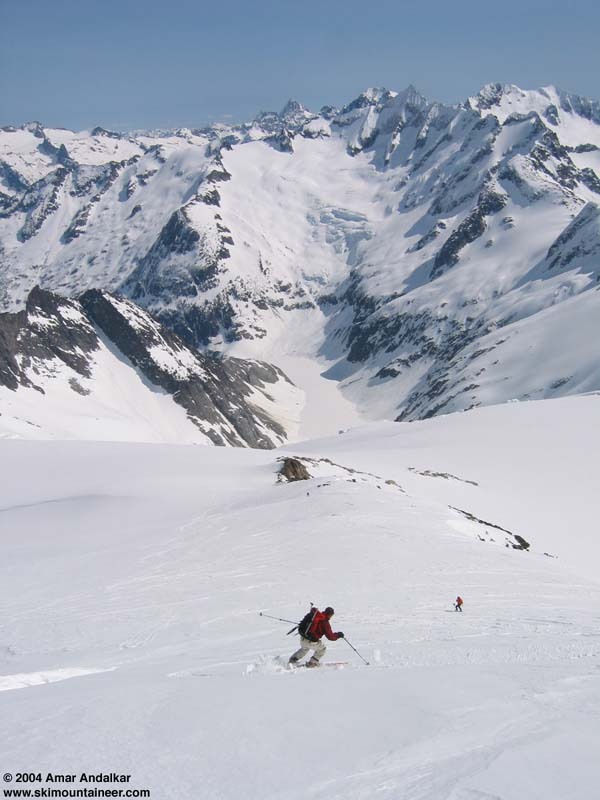 yeah, good write-up & nice photo, although that skier could use some work on his form! p.s. what about the shot of Paul's ski ricocheting like a rubber band down the glacier in front of him - that was pretty cool....how did he do that? I wasn't going to post a link, but here's a TR.